Your 4th of July bow is here! 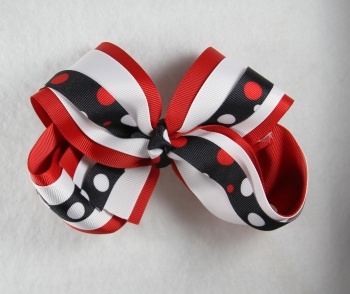 White and Red Polka Dots on a 5/8" navy blue grosgrain ribbon top off this great American colors bow. This is great for any Patriotic Holiday celebration. The bottom layer is a 2.25" red grosgrain ribbon with a 1.5" brilliant white grosgrain on top layered finally by the navy blue polka dots. There is 105" of ribbon to this triple layered bow! Now that's American style and American made.